Just do not stay at this hotel! PLENTY TO DO A NIGHT TAKE AWALK ROUND YOU WILL FIND SOMETHING TO MEET YOU TASTES. 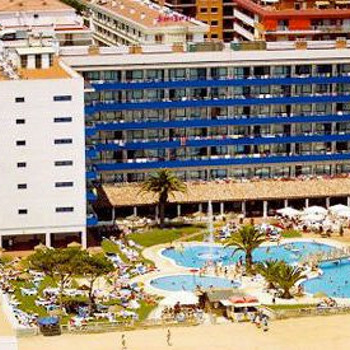 The resort of Santa Susanna is not like Lloret de Mar its a lovely resort but alot quieter it joins onto Malgrat de mar. The beach is lovely although as you go into the sea there is about 2 foot then quite a drop into the water so worth keeping an extra close eye on small children. The hotel Santa Susanna is right on the beach. There is a market through the high season which is on a Tuesday and it runs right along the main road (selling the usual food, clothes and nic nacs). My husband and I went for a rest from work and kids and we loved the time here. You can get the train into Barcelona which I think we would do if we go again. the best bit about this visit was discovering the drunken duck pub, which is up the side street next to burger king. it is really friendly with the staff happy to talk to you. they had a good selection of food, all well cooked, at realistic prices. they even have a book exchange. Main strip of Hotels. Some Clubs, lots of shops and ice cream parlours. Gritty beach but nice enough. Didnt feel sea was safe as sudden drop a few of feet out. The beach is a man made beach and the sand is not soft, it is a critty sand, but still lovely to play and sun bathe on. the are traders on the beach who offer you a massage for five euros,which was worth the price. there is a market just to the left of the hotel near the little bridge every tuesday, which is worth a look. a lot of the resort opened up for the Easter braek but closed down again aroung the 7 April and do not open until the end of April, but still there are lots of other shops and bars open at this time of year. the rovers return bar is worth a visit, nice cup of tea for 1 euro 20cent, and they have football, only fools and horse and sky channels on the telly. Beer not to over priced cost around 3 Euro a pint, Just like home really, except when you go to Barcelona you can pay up to nearly 6Euros for a pint of beer, so take plenty of money if you go for the day. we went on the excursion with the hotel cost 15Euros each it was worth it, but when speaking to others it cost them aroung 5 Euros on thetrain, if you can work out r=the train sysytem you will be okay. but coach from hotel takes you straight there and drops you in barcelons for 5 hours so plenty of time for shopping and looking at all the fun entertainment in the ramblers. lovely resort,did'nt think much of the beach as it was very gritty, hurt your feet when walking on it.i prefer soft sand. apart from that, it was fine. great food, clean, & good baby changing facilities, cant wait to go back next year. the resort is very quiet, more suited to people who want to sit on beach every day reading a book. we like to do things during the day and only thing we done was visit barcelona for the day which was good. went to two of the h=top hotels locally both the same with food only went for a week but was a long week, would not return even if was free. the resort was ok a few bars and a few shops and a massive supermarket, next door.this is all within ten mins of the hotel, just go and try it, you will be amazed.the beach was very nice, and a lovely prom to walk on.